It is not enough to create a quality product which will blow away your customers; nowadays, you will have to think about how to present it to your buyers. Now, it has become necessary to pack it in a way that will draw the attention of the buyers. The use of pillow boxes for packing has gained some popularity in this area. The method of packing a product just for the sake of packing has been done away with. The product, these days, are wrapped within a package that contains the name and location of its sellers. They are used as a tool for marketing the brand of your company. The pillow gift boxes have enough space for you to put the logo of your company on it. You can choose the size and the design of your choice when you order these custom made pillow boxes. It can be large or small depending on the product that you are selling. Although there are various colors and design available for these pillows, the white pillow boxes are the ones that look the most elegant among others. You can also embellish them with designs that will make it more appealing to your buyers. The kraft pillow boxes are robust and guarantee that the product resting within it will remain safe during the shipping of it. The flaps of these boxes are so arranged that they do not need adhesives to stay shut. The flaps are tucked into one another and remain like that until the buyers pull them out. These are available in various sizes and you can choose the size that you think will best cover your product. It is also available in many colors. You can create pillow favor boxes for different parties. You can choose them to be of various colors and designs. You can create specific boxes for weddings or for other parties. You can simply use any design on them, or you can also write something on their covers. On the pillow boxes for a wedding, you can congratulate the happy couple by having something written on them. For other party, boxes write something witty that will amuse the buyers. These types of boxes can also be used as gift boxes during holidays and so can have a festive look on them. There are assortments of colors from which you can choose, to give it the look of festivity. You can also create festive designs to accompany the color of your choice; so that, your buyers can easily identify it with the upcoming holiday seasons. GoStickers supports your enterprise by bringing forth designs, which will help you to make up your mind. If you already have a design for these boxes, you can relay it to us; and we will get it done in time. You can also order for these pillow favor boxes wholesale to satisfy the demand of your buyers. If you have the packaging boxes ready, you will have no problem shipping out your product once the orders start to come in. You will also get a free shipment from us; so, it makes sense to place a wholesale order. Delivering your products in custom-made packages will do your business good. Carrying all the details of your business; these packages still manages to look good. You can add pictures and stickers on the pillow packaging to give it a more personal feel. You can get it designed in such a way that your buyers get engrossed by it. The whole idea behind these custom made boxes is to advertise for your company without paying a hefty amount for it. 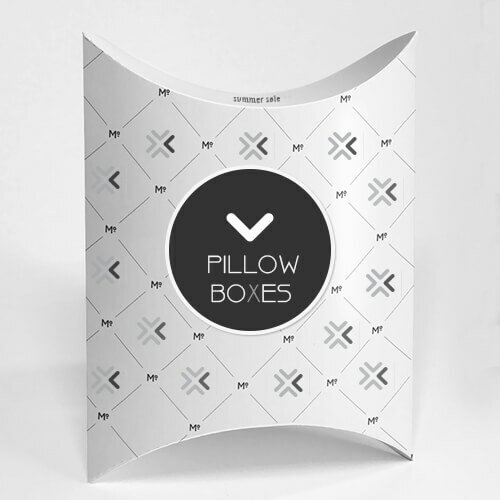 The pillow boxes come in various sizes and you will have to select the size that you think that your product requires. The small pillow boxes usually contain treats, soaps or other such smaller items. You can also design it by using cut-outs or prints. You can also write annotations on these boxes to make it more engaging to the buyers. In the end, you will have to create the perfect box that describes and nestles your product properly in it. The cardboard pillow boxes can be used to contain products of a different variety. You can use it to ship jewelry or candy or other products as the material is quite tough. You can also use various designs to give it the look that you wish for it. You can attach a string on its top and make it look like a small purse. You can also use strings so that you can knot them into a bow: a proper way of using it as gift wrap. You can keep its original color or use the color that you like.